Sussex complete their early-season block of Specsavers County Championship fixtures with a trip to Canterbury to face Kent, starting on Friday. Sussex head coach, Jason Gillespie has named a thirteen-man squad for the trip. Ishant Sharma returns after missing the previous match with a shoulder injury. He comes in for Stuart Whittingham. Sussex go into the match having completed a dramatic final-day victory against Middlesex on Bank Holiday Monday. 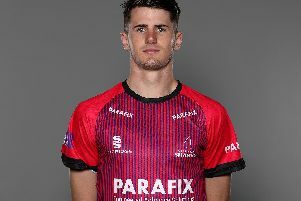 Ollie Robinson put in a man of the match performance with eight wickets and a half century, whilst Harry Finch recorded his first Championship century and captain Ben Brown took the side over the line with an unbeaten 65 during Sussex’s run chase. Robinson has 16 Championship wickets so far this season, two more than teammate David Wiese. Brown’s 268 runs make him the second-highest run scorer in division two. Sussex have four batsmen in the top ten: Brown, Michael Burgess (237), Finch (211) and Luke Wells (196). The win against Middlesex elevated Sussex to second place in division two, ten points ahead of Kent in third place. This will be Sussex’s first visit to The Spitfire Ground in the competition since 2008. Kent have played three games, one fewer than Sussex, with two wins and a loss behind them. Their most recent result was a six-wicket win inside three days against Glamorgan at Sophia Gardens last week. New Zealander Matt Henry took eight wickets in the match to take his 2018 Championship tally to 27, six more than anyone else in the division. South African Heino Kuhn is Kent’s leading run-scorer in the competition. His 168 runs put him in 19th place overall. Speaking ahead of a return to the club where he spent 10-weeks coaching last season, Gillespie said: “We’re looking forward to the challenge of playing Kent at Canterbury. They have played some very good cricket and have a number of players in form. I’ve been very impressed with the way we have been able to adapt to match situations this season and our efforts have simply been outstanding.